Tacos Los Amigos taco truck in East Oakland. It’s a Monday evening just after 11 p.m. as I pull into the Tacos Los Amigos parking lot on East 14th Street (also known as International Blvd.) I was referred to this taco truck by veteran graffiti writer Ceaver (640, Lords crews), who claimed it as his favorite late night food spot. Known as a foodie in the local graff community, the Mayor of Oakland Streets recommended the steak cheese fries. Ceaver had said that “a little bit of everybody” can be found here in the middle of the night, and indeed, there are Islanders, Latinas, and African Americans. Noticing that five of the seven customers waiting in line in front of me and all four workers in the truck are women, I realize why he likes this spot. The food is bomb too, there’s ample off-street parking, a security guard, a port-o-potty, and it’s open until 3 a.m. It isn’t news that the East Oakland flatlands are a working class part of town that is considered to be a food desert. During the day, there is a significant disparity between healthy food options available in the flatlands and up in the hills. At night though, that disparity is reversed. Aside from a drive-in burger joint in the Dimond and a corporate faux-Mexican drive-through in the Laurel, there are no other places to get any food late night up in the hills. In contrast, the flatlands of East Oakland need to have late night food options because working class people don’t always live a 9-5 schedule. In a part of town where food options are minimal during the day, where can people find food in the middle of the night? When it comes to the East Oakland flatlands, Yelp won’t necessarily help. You have to actually hit the streets to get this type of information, so I turned to the graffiti community to get the scoop on their favorite late night food options. East Oakland might be a food desert, but todos somos gorditos and we love our loncheras. 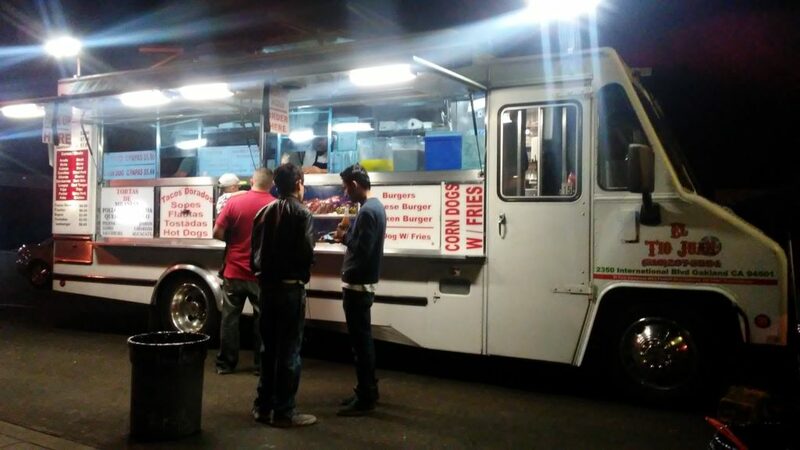 Since 2001, food trucks and pushcarts have been legally allowed in East Oakland. Legislation is currently in the works that will open up the rest of Oakland to food trucks, but aside from special permitted events in or near downtown, food truck proliferation has been relegated to the Eastern flats. Rush from Beast Oakland considers the taco truck to be such an iconic symbol of Oakland that he created a t-shirt in its honor. He wanted to create a design that said, “I Love Oakland” without actually saying it since that has already been done. 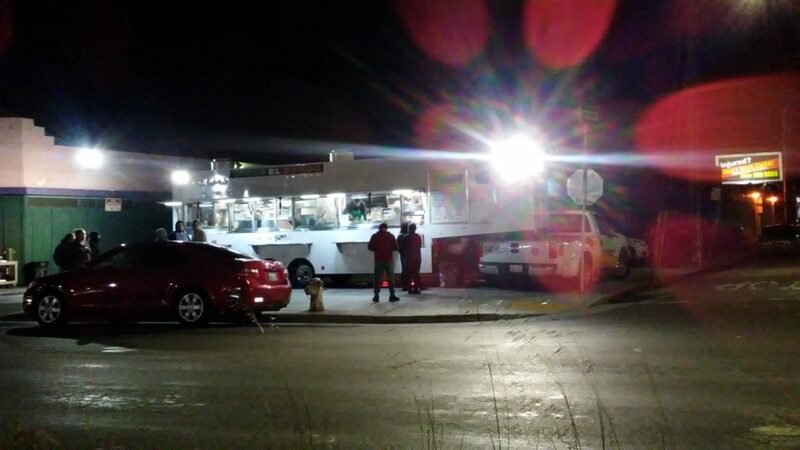 El Novillo taco truck on Fruitvale Avenue, Rush’s favorite spot and the inspiration for the Beast Oakland t-shirt design, is open until 1 a.m. during the week and 2 a.m, on the weekends. Rush says that El Novillo is always there for him; the folks that work there are good people who are friends of friends, and “the cherry on top” is the fact that they serve raw green onions with their tacos. They really do pile on the con todo. “They burritos be smackin!” agrees Enem (TDK, KTS, FLYID, UCIT, WAB TKU crews). Tacos Mi Rancho taco truck on 1st Avenue can only loosely be considered East Oakland, but it is open until 2:30 a.m. King 157 (RTM, FSC, TMF, TDK crews) claims this as his favorite spot. He likes the Big Papa California Burrito with everything, including “a tall glass bottle of cold Mexican coke smuggled in from the motherland.” He considers that meal to be a “happy ending” to a good night. “I have a Chucky Cheese smile and I keep coming back for more,” he said. Given its proximity to the lake, there are usually crowds. Tacos Sinaloa on 22nd Avenue has been perhaps the trendiest truck for a while now, and it’s Amend’s favorite. Open until 1 a.m., they definitely know how to flavor and cook their meat. “The hipsters are raising the prices around here for everything, but I don’t mind paying for food when it’s good,” says Amend. Sinaloa’s popularity has contributed to longer wait times, but at least there’s a parking lot, seating, and restrooms. You can also often times peruse the latest DVD releases while you wait. Rush says that Sinaloa’s food has it at his number two-B spot, just barely behind Mi Grullense on East 14th, which is his two-A choice because of personal memories from the 1990s. El Tio Juan taco truck in East Oakland. 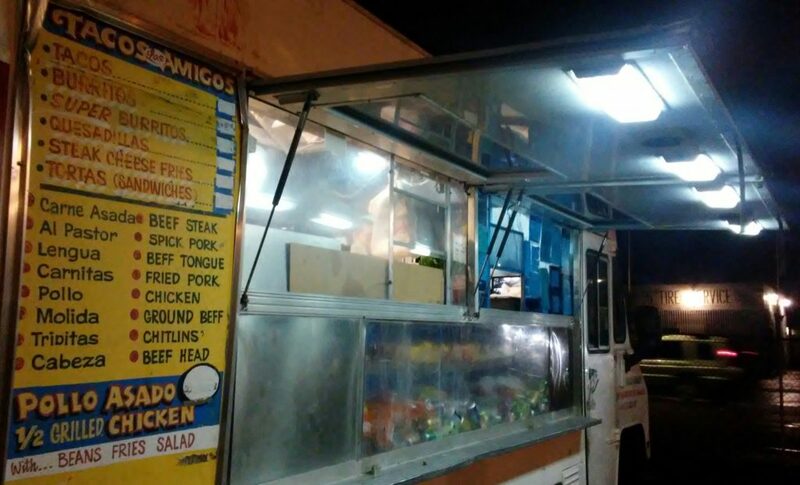 El Tio Juan taco truck on Foothill is only open until 11 p.m., but Thief (640) says it’s his favorite spot. “They are always fast and it’s a safe environment, and if you need some liquor, you can go across the street.” Taste and preparation-wise, they rival Sinaloa. Lehs does have a favorite spot out in the East though, an unpermitted operation deep in the cuts. Without naming names or locations, this particular spot is good. In general, if you really live in the East Oakland flatlands, you already know about these spots and you probably got one in your neighborhood. Tacos El Gordo in East Oakland. Another legal spot that Rush recommends is Tacos El Gordo on East 14th. It’s open until 1 a.m., and because of its central location and good food, there’s always a crowd. This truck has exceptionally large windows which are usually pretty clean so you can clearly see inside where all of the magic happens. During colder weather, the truck gets really steamy inside and looks even more magical. Their al pastor is muy bien. Though it isn’t a taco truck, Nikko’s Cafe on 23rd Avenue is open 24 hours. “When I want to celebrate when I did some good painting and want a breakfast spot, that’s my number one spot,” says King157. He calls the the breakfast with hash browns, biscuit and gravy, sausage, eggs over medium, and a coke “the real deal Holyfield meal.” His grandfather used to live across the street, and he says that Nikko’s has been around forever. There used to be a lot more late night food spots all over Oakland, but that has changed considerably over the years. Now, the Eastern flatlands are your best bet. People up in the hills may have more money and more grocery stores, but we got food in the middle of the night. They may have Taco Bell, but we got loncheras. I thought you were about to give up some of my secrets. Man, I worked hard to gain my knowledge. Too bad I never picked up a can, or you could have interviewed me. Not like I would have given you any info on my cutty spots.